Definition at line 41 of file llmediabase.h. Definition at line 63 of file llmediabase.h. Definition at line 56 of file llmediabase.h. Definition at line 38 of file llmediabase.cpp. Definition at line 47 of file llmediabase.h. Definition at line 200 of file llmediabase.cpp. References LLMediaEmitter< T >::addObserver(), and mMediaEventEmitter. Definition at line 133 of file llmediabase.h. Definition at line 134 of file llmediabase.h. Definition at line 188 of file llmediabase.cpp. References mMediaDepthBytes, mMediaHeight, mMediaRowbytes, and mMediaWidth. Definition at line 181 of file llmediabase.cpp. Definition at line 174 of file llmediabase.cpp. Referenced by LLMediaEngine::createImageRaw(), and LLViewerImageList::updateImagesMediaStreams(). Definition at line 167 of file llmediabase.cpp. Definition at line 132 of file llmediabase.cpp. Definition at line 139 of file llmediabase.cpp. Definition at line 146 of file llmediabase.cpp. Definition at line 160 of file llmediabase.cpp. Definition at line 153 of file llmediabase.cpp. Definition at line 125 of file llmediabase.cpp. Definition at line 118 of file llmediabase.cpp. Definition at line 82 of file llmediabase.cpp. References mMediaEventEmitter, LLMediaObserver::onInit(), TRUE, and LLMediaEmitter< T >::update(). Definition at line 105 of file llmediabase.h. Definition at line 108 of file llmediabase.h. Definition at line 106 of file llmediabase.h. Definition at line 107 of file llmediabase.h. Definition at line 95 of file llmediabase.cpp. References mMediaEventEmitter, LLMediaObserver::onLoad(), TRUE, and LLMediaEmitter< T >::update(). Definition at line 101 of file llmediabase.h. Definition at line 58 of file llmediabase.cpp. Definition at line 102 of file llmediabase.h. Definition at line 100 of file llmediabase.h. Definition at line 207 of file llmediabase.cpp. References mMediaEventEmitter, and LLMediaEmitter< T >::remObserver(). Definition at line 135 of file llmediabase.h. Definition at line 103 of file llmediabase.h. Definition at line 109 of file llmediabase.h. Referenced by LLMediaEngine::convertImageAndLoadUrl(), and LLMediaEngine::handleSizeChangedRequest(). Definition at line 73 of file llmediabase.h. Definition at line 104 of file llmediabase.h. Definition at line 99 of file llmediabase.h. Referenced by LLMediaEngine::stop(), and LLMediaEngine::unload(). Definition at line 108 of file llmediabase.cpp. 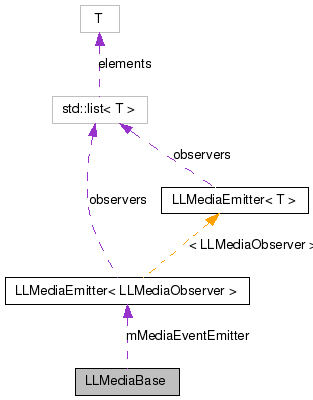 References mMediaEventEmitter, LLMediaObserver::onUnload(), TRUE, and LLMediaEmitter< T >::update(). Definition at line 115 of file llmediabase.h. Referenced by bufferChanged(), getBufferChanged(), and resetBufferChanged(). Definition at line 116 of file llmediabase.h. Referenced by getBufferChanged(), and resetBufferChanged(). Definition at line 120 of file llmediabase.h. Referenced by getMediaBufferSize(), and getMediaDepthBytes(). Definition at line 113 of file llmediabase.h. Referenced by addMediaObserver(), init(), load(), LLMediaMovieBase::pause(), LLMediaMovieBase::play(), remMediaObserver(), LLMediaMovieBase::stop(), and unload(). Definition at line 119 of file llmediabase.h. Referenced by getMediaBufferSize(), and getMediaHeight(). Definition at line 121 of file llmediabase.h. Definition at line 118 of file llmediabase.h. Referenced by getMediaBufferSize(), and getMediaWidth(). Definition at line 124 of file llmediabase.h. Definition at line 125 of file llmediabase.h. Definition at line 126 of file llmediabase.h. Definition at line 128 of file llmediabase.h. Definition at line 127 of file llmediabase.h. Definition at line 123 of file llmediabase.h. Definition at line 122 of file llmediabase.h.